M&W Legals has over 30 years experience providing a variety of strata inspection, property and legal search services. A family-owned business, across three generations, our client commitment is driven by one simple question: if our family member was buying this property what would we want them to know? Nor do we enjoy seeing our clients, in a competitive real estate market, spending hundreds on multiple Strata Reports before they are successful in purchasing their property. Buy Now changes the model. You still pay for the full report – but only if you are successful at purchase. 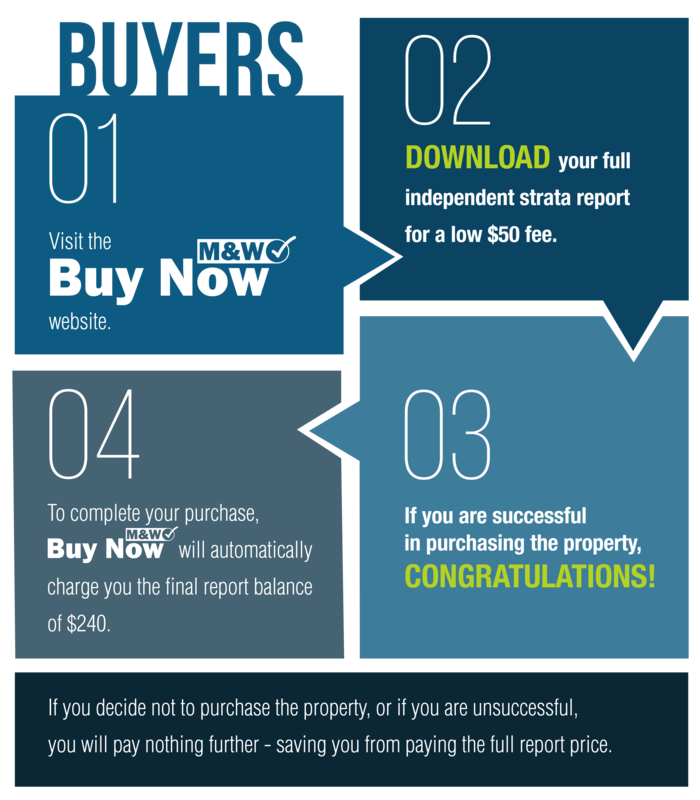 With Buy Now you pay a small fee to access the Strata Report of the property you wish to purchase, but if you find yourself unsuccessful – or decide not to purchase the property – there is nothing more to pay. If you do purchase the property, then you pay the final balance of the full-priced report. You, the Buyer, save money. You pay for one full-fee Strata Report for the property you purchase – rather than many for all the properties you don’t!